US Regulatory outcomes. Does the punishment fit the crime? There is a widespread perception that European Banks are disproportionately penalised by US regulators following a compliance failure. Representatives from both US and European banks privately admit this. On first glance, the data appears to back up this assertion. Data from the Corlytics’ Economic Crime Barometer that covers anti-money laundering/bank secrecy act, sanctions, fraud, bribery, tax evasion and misappropriation illustrates that over the previous five years, just 10 European banks have paid 40% of all fines to US regulators. In fact, the average value of a fine for financial crime transgressions for European banks is almost $0.5 billion USD, which is over 10 times the average that US firms pay to US regulators. However, while the top level figure provides great headlines, it lacks the deep analysis that more accurately characterises the actual behaviour of the US regulators. Examining the major economic crime violations in more detail shows that fines for violations of US sanctions on Iran is, unsurprisingly, a particularly egregious failure. One European bank accounted for almost $9 billion in fines for these sanctions violations in 2014 alone. Why didn’t US banks get fined? Well, they didn’t violate sanctions to Iran. And maybe that gets to the heart of the issue. When US banks understand the potential financial and non-financial consequences of non-compliance, they act accordingly. The European institutions seem to lag behind. If we look at the largest ever financial penalty for any institution, it was levied by a US regulator for selling mortgaged backed securities during the sub-prime crisis that was instrumental in the financial crisis. That fine was for almost $16 billion USD. It was more than double the value of any levied on European institution, despite European players also being guilty of sub-prime transgressions. When, looking a little deeper at these enforcements, almost 50% of both of these highlighted penalties were for restitution to customers, illustrating that rulings were applied in a similar manner. It is interesting to note that US banks have received more fines over $1 billion than non-domestic banks. When it comes to levying enforcement outcomes, what is clear is that US regulators examine the impact on the economy, the stability of the financial system, and crucially the damage inflicted upon consumers. 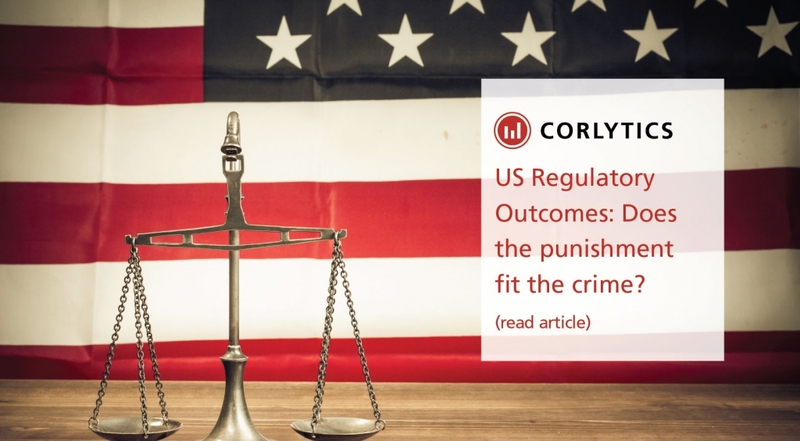 US regulators ensure that hard pressed consumers are made whole again, applying penalties that make the financial institutions change their behaviour for the better. Changing malpractice within financial institutions is a clear indicator that the punishment does fit the crime. For financial institutions, understanding the root causes of rulings is crucial to ensuring that transgressions don’t occur again. While understanding the quantum of the fine is important, understanding the control failures, which legislation and regulation was contravened is key to understanding a regulator’s intent. Corlytics provides this intelligence to financial institutions, inform risk control self-assessments, and steering compliance efforts to protect the firm. Should you have concerns about your regulatory risk exposure and the impact that it may have on your business, please don’t hesitate to contact us.